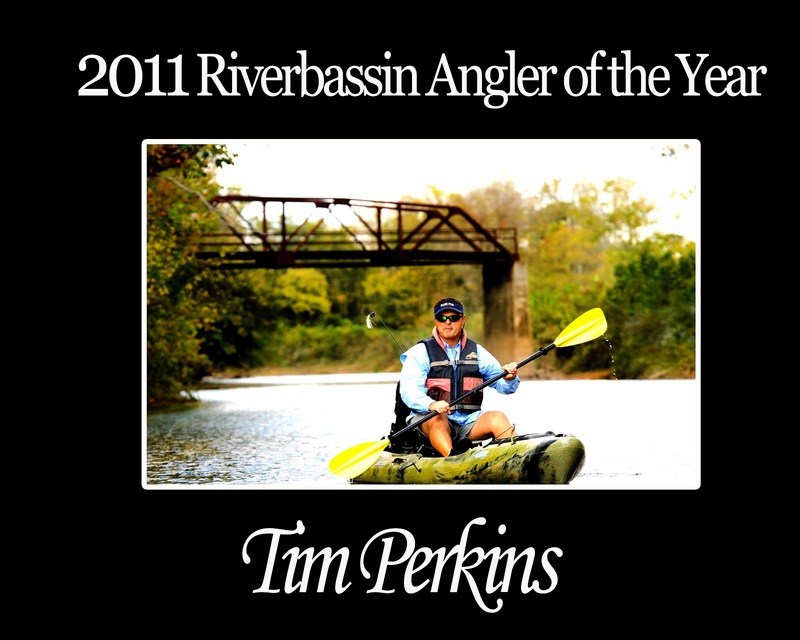 I had met Tim Perkins, in passing, once or twice before at various RiverBassin' Tournaments. But it was at the 2011 RiverBassin Tournament Trail finale in Roanoke, VA that we had our first significant conversation. It was there that two competitors became good friends. Now Tim and I regularly discuss all things kayak fishing, and also just talk about life. This past spring I had the pleasure of spending a couple of days with him in Alabama - chasing river bass and enjoying the graciousness of he and his family. Tim was the 2011 RiverBassin Tournament Trail Angler of the Year and finished toward the top of the standings in the 2012 SKA Tournament Trail as well. He has also been a long time guide and steward to the outdoors with his company RiversEdge. He held the Alabama state Redeye bass record for nearly two decades and has caught a pile of big fish over the years. He is hoping to publish his first book within the next year. I got a chance to pick his brain a little bit over the past week or so. Here is part I of the interview. Enjoy! There are a lot of great kayaks out there on the market! Each kayak seems to have its own ideal application. I look at my kayaks as tools for specific jobs. I’ve been blessed to have the opportunity to have a diverse personal fleet. My personal passion is to fish small rivers and creeks here in the south. The tool of choice for this application is the Commander 120 by Wilderness Systems. It is just a great fit for my personal use. I would have to say a Premier League Lure spinnerbait. A chartreuse and white “ River Special”. 3. Biggest catch from a kayak (any species)? 9.06 lb largemouth , 4.12 lb Alabama Spot , 5.0 lb smallmouth & 43” Muskie all of which came off of a PLL River Special....LOL honest truth! Man you are putting me on the spot (LOL). The two greatest fishermen that were my partners have both left this walk in life! My grandfather, John D Blanton, probably the greatest river man I ever knew. My childhood friend, Joseph Norton, he and I were raised by the river . In their honor I named my twin boys. John Berkley and Joseph Fisher Perkins. I’ve had some awesome opportunities to fish with some great fisherman . I would say in the kayak world Lance Coley. Lance was the 2010 RB champ. We teamed up for the 2011 RB season in the Team Div. and complimented each other perfect! We threw up some impressive numbers that will be around a while (LOL). We got Runner up nationally behind a pretty impressive team (you & Bill)! Lance is a great partner and friend! 5. Person you would most like to fish with some day? Seriously, since I’ve had the grand opportunity to fish with you Drew I’ll have to really think about that. You know you were the kid on my back last year on the trail that seemed to never go away . You stayed consistent the whole trail. I had to tip my hat to you, and respect you - you are one great fisherman! You know if you remember some of our conversations at nationals you and I had actually put together almost identical water plans. It was almost scary. I was going to fish the water you and Bill fished all the way up to night before the tournament (LOL). I can't really give you rationale behind my change - instinct I guess. Any way it was a treat to fish with you guys finally and not on a competitive note (this year)! I guess Dalton Bobo, a BassMaster great and owner of Premier League Lures. We’ve actually fished together but not from a kayak - I know he would love it. 6. Favorite body of water to fish? That is really according to what species of bass (I want to chase). There is one small river and two small creeks here in Alabama - I’ll take their mysteries to my grave...LOL. Each are responsible for my largest river largemouth, Alabama Spot and Redeye. But abroad its hard to beat the New River, Broad River and the James River. Catching fish on these (local flows) is just a bonus. 7. That one item you can’t leave home without? That’s easy a PLL River Special spinnerbait - the most versatile bait in my box . I fished 42 different rivers and creeks last year. I caught, photographed and released over 1200 bass. 90% came off of a Premier League Lure River Special. I always had 4 items (during competitions)...LOL. I wore a cross, and my wife has one identical, to remind me of my beautiful wife and how blessed I am with her! I carried two little stress balls shaped like bass to always remind me of my twin boys...LOL. And the last item I wore in every competition was a grey wife beater made out of a cool dry t-shirt (LOL). Uniform I guess for redneck ninjas! 9. What one place you’ve never fished is highest on the wish list? Probably a fly-in trip between the US and Canada Border. 10. And going the non-fishing route, favorite song? Man you're dating me! I love all kinds of music. Probably one of my favorites is John Denver “Annie’s Song “ or “Thank God I’m a Country Boy”. Ok, now some longer answers…. 11. I am a proponent of getting kids involved in the outdoors as much as possible and I know you are too, particularly through your organization - River’s Edge. Tell me a little about the goals of RiversEdge and what y’all do. RiversEdge (RE) was founded and based on providing an outlet for underprivileged teens as a deterrent from less desired activities. I actually ran an alternative school for about 10 years. My background around some of these troubled teens gave my wife an I the idea of RE. I actually took kids fishing as a reward, so to speak. The word got out and of course everyone wanted that deal. It's sad there is that big a need for something as simple as fishing. We started offering paddle camps to rural children. Now we do work with church groups, rec departments, social events, fundraisers, and families. I guess if we have a specific goal it would be to reach as many kids as we can with our resources - to pass it forward so to speak. Growing up in the south, fishing was a way of life. Fishing played a big part in my life from a young boy to present. It was our outdoor enjoyment, our connecting with friends, our challenge, our adventure, and our peaceful escape. And also to make a difference! I think last year we did 8 camps, a couple church groups and numerous speaking type engagements. We love sharing our passion. If we break even we’ve done well...LOL. It's hard to put a price on the rewards my wife and I receive! If we can be a difference to just one (that is what matters). 12. You traveled all over the US last year fishing the RiverBassin Tournament Series. What were some of your favorite places to fish along the way and best memories? I was truly blessed to have had the opportunity to fish some awesome places last year. I have stories and memories from all of them. As a matter of fact, I started a little tradition last year. I collect a few small stones from each body of water I had the privilege to fish. I bag and label them just as a little reminder I had the opportunity to have fished there. I've got a ton of stories...you know me, never a loss for words in my upcoming book. I'm so excited about that project. Virginia was probably my favorite, for personal reasons . I mean I fished some really cool waters last year. I mean I CPRed 1200 plus bass last year - who wouldn’t enjoy that! I was able to find water I was comfortable with in every state except Virginia. Virginia was the most challenging , because I'd never had the opportunity to fish their type of waters. See I basically was able to power fish all the way thru the south. Water, for most part, was familiar to what I was used to fishing. I get to Virginia and its clear water and rocks and rocks and rocks and current, LOL! In preparation I had to teach myself how to fish all over again - spinning equipment, small lures, etc. But it was more about presenting the bait almost like fly fishing. In tournament fishing if you are forced to play another mans game you are in trouble. That was me. Then something miraculous happened - a hurricane came thru the week of competition! Watch it now I’m fixing to teach you something FREE. My waters on the New River were out of the Bank 5 feet and rolling muddy! This competition just got moved back in my house! I could power fish my spinnerbait in that muddy water. By the tournament the water was at least even with original banks and less muddy. Dude you could take a big PLL RiverSpecial Spinnerbait, if you could hit an eddy out of that current there would be a monster smallmouth. I will always remember that lesson the river taught me! 13. You also won Angler of the Year in the RB series in 2011 (I believe a very handsome guy took 2nd). Where does that rank in terms of your fishing achievements and what are some of the others? Winning RB title does rank towards the top, of course, for a number of reasons. The hard work and dedication by the parties involved, like my beautiful wife and family, that ultimately paid off! It was my first major award out of a kayak! I’ve never looked at the RB title as a ME win. I look at the fact that I represent a lot of river people that didn’t have the opportunity or resources to fish abroad as I did. For the great sport of river fishing, one of the most overlooked arts of fishing. For all the great fisherman that took the time with me! -National Fishing Hall of Fame (Redeye Bass); Alabama State Record (Redeye Bass) 1985-2000; Life Member of BASS; Magazine Cover; Outdoor Model (LOL, back in the day); Fishing Journaled 20 plus years; successful guide for 20 years with RiversEdge; Seminar Instructor; 28 LargeMouth over 9lbs (12.02 is largest to date ); 6 Alabama Spotted Bass over 5 lbs; 5 Smallmouth Bass over 4 lbs; 3 RedEye Bass over 2lbs....and landing my awesome wife - CATCH of my lifetime! 14. What made you start tournament fishing? I guess it was my sports background. I was a college baseball player whom went on to coach. I’ve coached for 28 yrs - I love to compete! I grew up fishing...it was a way of life for me. I’m actually a third generation riverman, so I put the two together. Competitive fishing has been good to me as well as good for me! I tell you I've learned some tough, humbling lessons tournament fishing also! I remember a time Drew, in the mid 90’s, that I let competition take the fun out of fishing. I had to take a serious look at what I was doing. Competing was consuming me. It's all in my book I’m working on - LOL. 15. I talk with a lot of kayak tournament anglers and many tend to burn out if they fish too many competitions. They also think that a lot of these events include too much drama and politics. Do you have similar feelings? I know exactly what your saying. I know plenty of guys that are right there now. My views are based on the fact I've been in two separate arenas of competitive fishing - the bass boat world and now the kayak world. There are a lot of guys that want to be KVD for instance. Someone at the top of their game - like Chad Hoover or Drew Gregory in the kayak world. One of the major reasons I left the bass boat world is frustration. Frustration that merit isn’t rewarded. There so many guys who wanted that top spot and the industry had watered the merit so bad It wasn’t worth the pursuit. You and I have talked before about the term professional. Really man, if I’m having to take my money to pay my way, what’s professional about that. Basically the fishermen are swapping out each others money and the industry is benefiting at no cost essentially. The business is full of people catching handouts without having to pay their dues! Now in the kayak world the same thing is happening, just not at the depth of the BB world yet. In pursuit of glimmer...LOL. But in my years I’ve seen some very deserving guys passed over. I know at least a half dozen river guys whom are like the Fathers of the sport and the industry has turned their back on them. No reason, just because they can. And I promise you all of them at one time had that glimmer promised to them and they found empty promises. It is definitely a sore spot and there seems to be a big price for glimmer! Professional really? Burnout is high! 16. 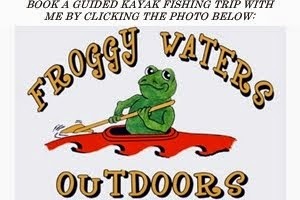 What are your thoughts about a national kayak fishing tournament trail for freshwater anglers? I think it’s waiting on just the right leader and also just the right format. I think we are sitting on the edge of an explosion! It will happen - just a matter of some guys getting organized and putting together a great package....some unselfish guys! LOL!